Both the City of Eugene and the City of Springfield are looking for new BPAC members. Apply and get engaged on building a better active transportation environment for our community! Eugene applications are due Nov. 22nd and Springfield on Dec. 2nd. The City of Eugene is seeking new Bicycle and Pedestrian Advisory Committee members. The application period is open until November 22, 2013. Terms begin in January 2014. BPAC meetings are held on the second Thursday of each month in the Sloat Conference Room at the Eugene Atrium Building (99 W. 10th Ave) from 5:30 to 7:30 pm.Guests and members of the public are always welcome to attend. All BPAC meetings are open to the public. Guests will be provided with opportunities to speak at the beginning of each meeting.Use the links on the right side of this screen to access meeting notes and related information. The staff liaison to the BPAC is Lee Shoemaker, Bicycle and Pedestrian Coordinator. He can be reached at (541) 682-5471. The City of Springfield is currently seeking applications from Springfield residents to serve on the Pedestrian and Bicycle Advisory Committee; applications will be accepted until December 2 at 5:00 PM. The City will fill up to eight (8) positions on the Committee from the applications received by the deadline. 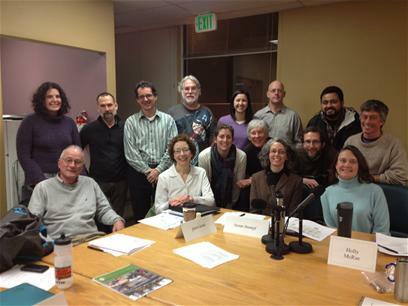 The Committee provides citizen input on pedestrian and bicycle policies, programs, and facilities. Applicants should have an interest in promoting pedestrian and / or bicycle interests in Springfield. The Committee meets approximately six times each year and candidates will be appointed to serve a two-year term beginning in January 2014.
Who: Springfield residents, electors, or property owners within Springfield’s Urban Growth Boundary can apply. When: Applications will be accepted until December 2 at 5:00 PM. Additional information: Contact Molly Markarian, Senior Planner, at 541.726.4611 or email at mmarkarian@springfield-or.gov.